For so long, all I ever knew was the work life. That was the most important thing. Circumstances have changed, and my outlook on my career and work life have also. It wasn’t just “I became a mom”‘; it couldn’t be that because it felt a little more complicated. It was a little saddening, so I thought it might be good to jot down my thoughts. Surprisingly, it was a relief to write this down; it was as if I came to terms with something that I was afraid would happen. What would life be like if it wasn’t always about work? I’m realizing…not all that bad. I dedicated my whole life to my career. I worked long hours, and sacrificed so many things. I gave my best to the job, because I believed the career was the top priority. My job was my identity. I wasn’t anything without it. My career defined my successes, and was my benchmark towards happiness. My pride came from what I do, and how well I did it. I didn’t want to know what giving 100% of myself was. I only knew to give 150%. Years and years of this made it a norm for me. I wasn’t anything if I didn’t have my work. So, I sacrificed self care, friendships and family time for it. Now, life has changed. I can’t give up things for work anymore. I was happy to a point, but I realized, it wasn’t as fulfilling as it should have been. I’m learning that there’s more to life and to my identity. I have a different focus, and another life. With the exception of the last two weeks, I’ve dialed it down. 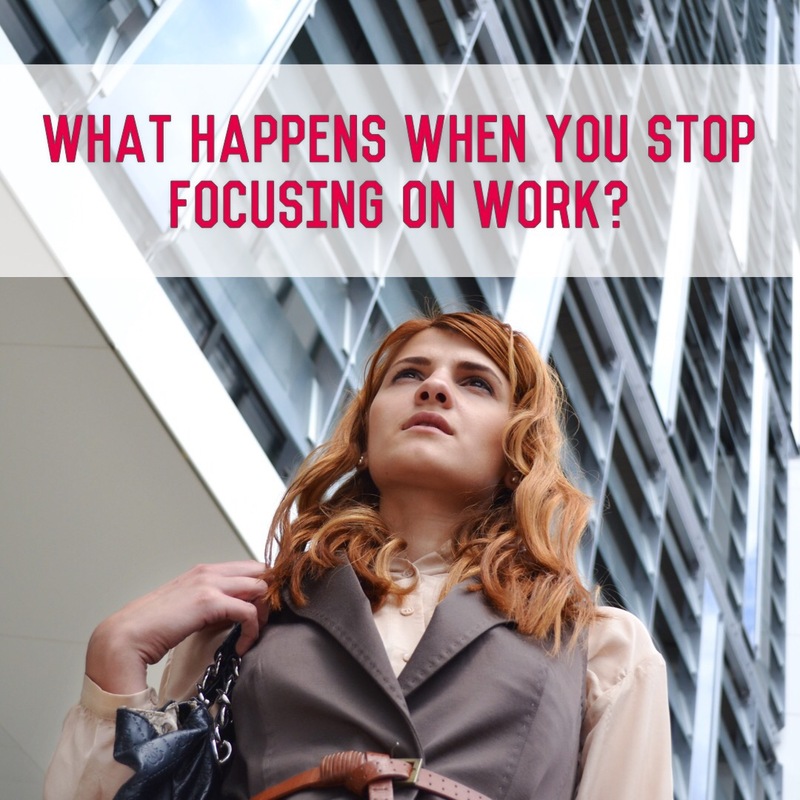 I’m now giving 100% of my focus to work – but mainly during working hours. I only work off hours when it’s absolutely necessary. I try to leave on time – if not within 30 minutes of close. I hardly check my work phone after I leave – just a quick glance to see if there are any urgent issues. Otherwise, I don’t deal with it until I come back into the office. I’m not saying I would ever quit working. I can’t. My career is still very much a part of me, and I’m still proud of my achievements and successes. Because of it, I have gained so much experience and exposure to the world. My family and I live a comfortable life. It’s hard to make the change, but I’m already seeing results. I’m less stressed. I’m happier than I was before. I’m finding more joy in life – with family, friends and for myself. I spend less time on work, but I am still proud of what I do. I appreciate my job for what it is, and I don’t feel like it is “stealing” my time. I’m trying to focus on finding value in the time I put into it. Of course, the change is gradual and there are periods where it feels like it’s a setback. These past two weeks felt like I wasn’t making progress. However, just with everything else, I need to look at overall progress and change. I hope that with more time, I’m able to keep a better balance. I owe it to myself to try! i love your new outlook. enjoy weekend. Balance is such a complicated things to achieve but I’m always aiming for it! Yes, a lesson we all could learn ! I totally understand this. They say that our absurd work/life balance is one of the things that sets America apart. In many other countries you are expected to leave work at work (New Zealand, France, Sweden, etc) I totally applaud you for doing this!!! It is so hard but it will inspire so many around you. Yes! In other countries they know leave it at work. It can be so difficult sometimes. They say that finding that work/life balance is one of the issues that truly sets America apart. In many other countries (New Zealand, Sweden, France, etc) you are expected to leave work at work. They live healthier lives for it, and I totally applaud you for trying to find better balance in your own life. It is so hard!!! So good for you! Keep trying it will inspire others! I’ve never felt this pride and dedication to any job I’ve had except motherhood of course. I sometimes wonder what it would be like if I stopped working from home and went back out into the working world ! I think your work ethic and pride in your career successes is a wonderful trait !! Thank you so much for sharing this. I find it very hard to work full time and taking care of a family so I can really relate to what you are saying. Finding work and life balance is so hard. I also wonder if putting in so much time and effort is a way to “pay your dues” so you can pull back a little and focus on finding a good balance. I can totally relate to this! My job used to be my identity and I sacrificed a lot of time with family and friends, like missing major milestone events, because I “had” to work. And you are so right, it is a gradual process. I slowly changed my ways. This was all long before I had my son but had it not been for that gradual process, I know life would be so much harder. Best of luck to you! Just like you, I had a hard time coming to terms with giving up my job. And at times, I have set backs just like you do! I love how my life has gone though, I wouldn’t trade my decision for the world. I love this! I had such an issue with stress when I worked in an office. Definitely not the right scene for me! I was feeling this exact feeling the past year that I worked after having kids. I did decide to stay home and I have loved every minute of it. I do miss going to work everyday and seeing other adults and *gasp* getting away from my kids for at least a little while! It is a fine line and hard to balance! Keep at it! It will seem hard at some times and easier at others.